Made in Japan, this ceramic Japanese mug has an earthen style similar to Spanish moss. Like the colors in Spanish moss ranging from a pale green to brown, no two Asian cups will ever look alike as they are each uniquely hand painted. 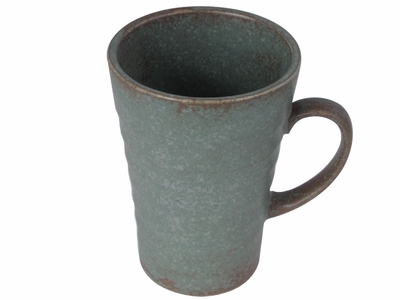 Part of the Moss Green collection, this Japanese mug has a soft paper like texture all throughout the cup. With a classic handle, this Asian tea cup also has ridges all throughout the center of the cup which makes it easy to hold, giving it a unique and interesting look to it as well. With no two cups having the exact same painted look, this Asian tea cup is mostly a pale green with speckled yellow green spots all over. Small blotches of a speckled pale brown also decorate the cup, finishing off the earth tone like look of this intriguing mug. Packaged individually in a paper box, this unique Japanese mug is a great gift for any hard worker that loves to relax with their favorite tea or needs a pick me up with some strong coffee.